In the 1970s, cities across the United States and Western Europe faced a deep social and political crisis that challenged established principles of planning, economics and urban theory. At the same time, film industries experienced a parallel process of transition, the effects of which rippled through the aesthetic and narrative form of the decade’s cinema. The Cinema of Urban Crisis traces a new path through the cinematic legacy of the 1970s by drawing together these intertwined histories of urban and cultural change. Bringing issues of space and place to the fore, the book unpacks the geographical and spatial dynamics of film movements from the New Hollywood to the New German Cinema, showing how the crisis of the seventies and the emerging ‘postindustrial’ economy brought film and the city together in new configurations. Chapters cover a range of cities on both sides of the Atlantic, from New York, Philadelphia and San Francisco to London, Paris and Berlin. Integrating analysis of film industries and production practices with detailed considerations of individual texts, the book offers strikingly original close analyses of a wide range of films, from New Hollywood (The Conversation, The King of Marvin Gardens, Rocky) to European art cinema (Alice in the Cities, The Passenger, Tout va Bien) and popular international genres such as the political thriller and the crime film. 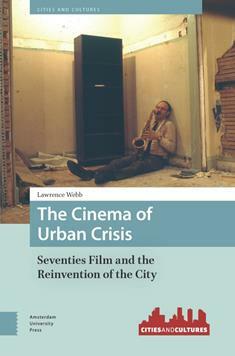 Focusing on the aesthetic and representational strategies of these films, the book argues that the decade’s cinema engaged with – and helped to shape – the passage from the ‘urban crisis’ of the late sixties to the neoliberal ‘urban renaissance’ of the early eighties. Splicing ideas from film studies with urban geography and architectural history, the book offers a fresh perspective on a rich period of film history and opens up new directions for critical engagement between film and urban studies. Read more at Amsterdam University Press here. Edgar Allan Poe’s story fragment, “The Man of the Crowd” (published in 1840 when Poe was living between Baltimore, Richmond and Philadelphia), begins with the narrator peering out onto a London street from a café, making observations about passersby: typologies of urban dwellers (“the tribe of clerks,” the “race of swell pick-pockets”), divisions of the population into age, gender, race and ethnicity. Finally, though, his gaze alights on an enigmatic character that eludes easy classification: “decrepit” and “feeble,” yet “he rushed with an activity I could not have dreamed of seeing in one so aged”; “without apparent aim,” yet characterized by “blood thirstiness” and armed with a “dagger”. Seduced by these paradoxical attributes, Poe’s narrator follows the man until sunrise, without, though, gaining any insight into the man’s history, nor of his ultimate aims. 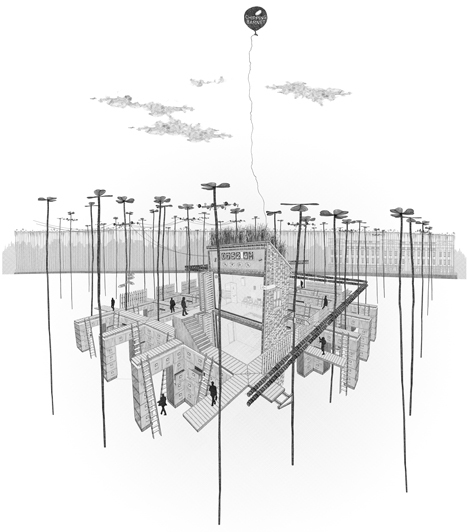 Within this brief fragment, we can see multiple approaches to the urban collide: the first, the assignation of types. The second, an ethnographic approach premised on direct observation of a single individual walking the streets. 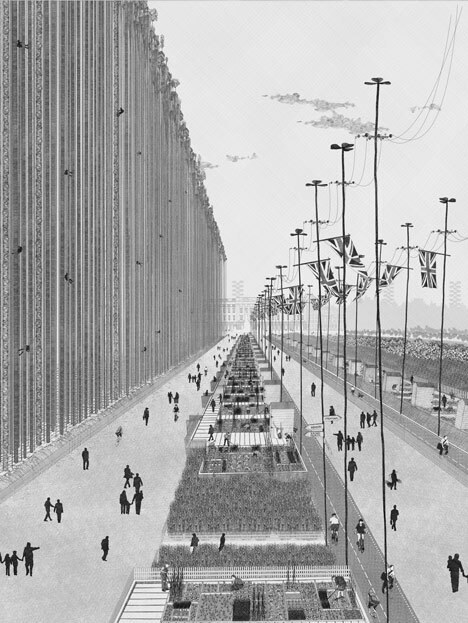 One approach attempts to make sense of the whole—to say something, in this case, about London’s (or Baltimore’s or Philadelphia’s) urban population and the growth of a heterosocial, public space in the mid-19th century (Walkowitz 1992). The second, the specificity of the individual in a particular place: what one could call the “daily round” of the individual. But both approaches prove inadequate to understanding the enigmatic man of the crowd. But what if Poe’s narrator had tried a network approach? 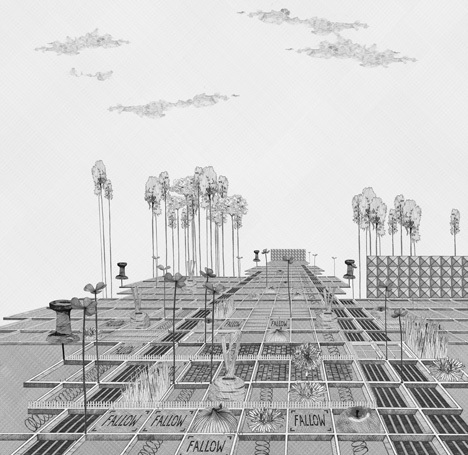 What if one could show that the man of the crowd’s apparently aimless wanderings were, instead, the outlines of a networked city connecting multitudes of nodes consisting of places and people? What if one could analyze those connections? As many have shown, the city is, literally, the sum of its networks, assemblages of place and connection that are simultaneously larger and smaller than the geo-political boundaries of the urban (Pflieger and Rozenblat 2010). Within this concatenation, people and place can be connected in myriad ways: the “strong” and “weak” ties that form the basis of much of social network analysis, but also in the form of a variety of “latencies” that, as Haythornthwaite (2002: 389) suggests, multiply in the age information and communication technologies and add new potentials to the elaboration of the urban networks around us. In a networked world, Poe’s narrator might be able to exploit these connections in order to connect to his man in the crowd and make sense of his world. And, indeed, this is what happens all of the time in urban life. Armed with various ICT’s (information and communication technologies), people trace complicated networks that include physical structures, transportation, socialites, technologies, economies and symbolic communications. But by tweeting, posting to blogs, utilizing geolocational apps and uploading photos and videos, people multiply possibilities for place- and sense-making, mobilizing virtual connections that might open up new possibilities for physical or spatial connections, that might make the strange into the familiar. This is an important difference from Poe’s time. Poe’s “man of the crowd” and Baudelaire’s “flaneur” depend upon a uniquely modern condition: spending a significant chunk of one’s life surrounded by complete strangers. On the other hand, in our ICT-inflected lives, nobody can be a “complete” stranger. Rather, in the fuzzy logic of social media, people on the street present different quanta of latency, different potentialities of connection that we may or may not be able to exploit. When we attend a rally and marvel at the disparate groups that (momentarily) cohere in a place, we’re witnessing the activation of some of those latent ties, and, most probably, their rapid dissolution. 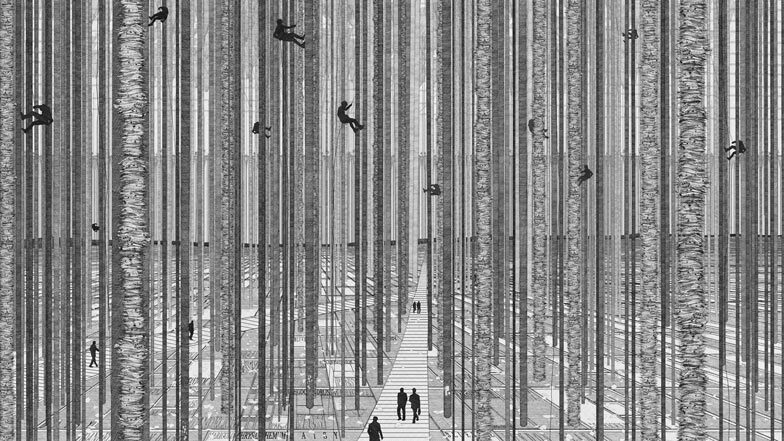 In that sense, a networked city is a striking departure from previous urbanities, particularly the alienated city of the late-nineteenth and twentieth centuries, the city that, by virtue of specialization, “makes one individual incomparable to another (Simmel), and the city that, in the absence of meaningful community, produces general normlessness (Durkheim). Of course, this doesn’t mean that people don’t feel alienation or anomie in the city, but rather that our understanding of the city needs to move from something more Newtonian to something else—a general relativity for the urban. Rather than parse off populations (or neighborhoods or institutions) as connected or unconnected, we need to see them as fields of potentiality, with a stranger not just a linear distance away (“six degrees of separation”), but as a simultaneity of probabilistic connections that are “latencies” whose significance cannot be predicted using linear models. But how can we build a quantum model for social networks in the city? Haythornthwaite, Carolyn (2002). “Strong, Weak, and Latent Ties and the Impact of New Media.” The Information Society 18: 385-401. Pflieger, Geraldine and Celine Rozenblat (2010). “Introduction. 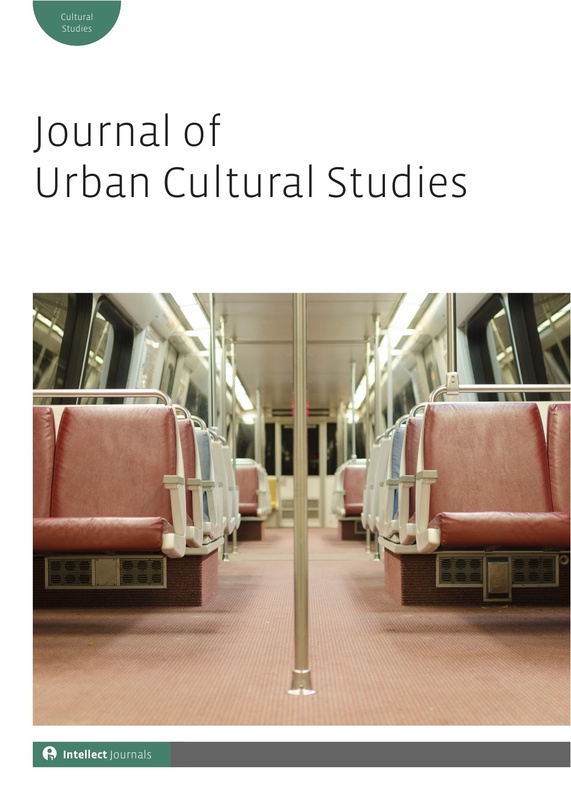 Urban Networks and Network Theory.” Urban Studies 47(13): 2723-2735. Walkowitz, Judith (1992). City of Dreadful Delight. Chicago: University of Chicago Press. 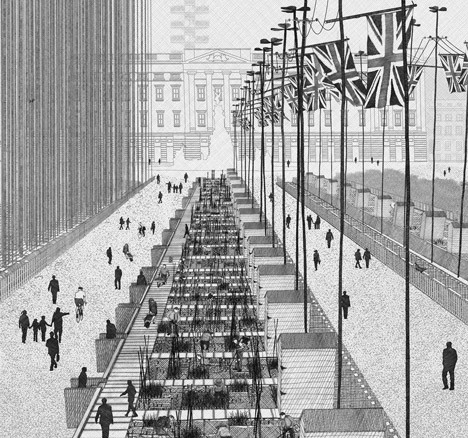 This series of hand drawings by Bartlett School of Architecture graduate Ned Scott presents a science-fiction world in which London grows a jungle of crops for fuel and food next to Buckingham Palace. The War Rooms, St. James’s Park imagines a future in which the UK’s energy supply has been cut following a war over energy resources in 2050. Scott presents a closed-loop agricultural system where London provides energy and food for itself without relying on imports. 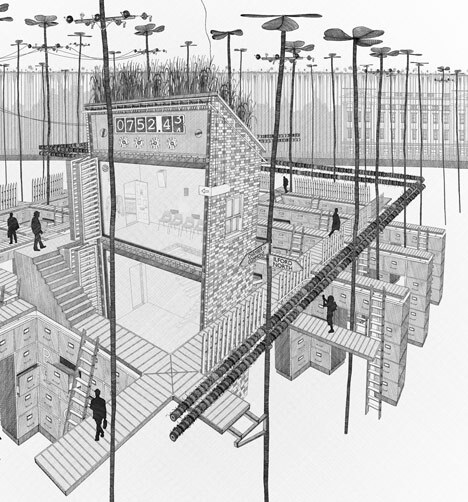 An anaerobic digester would stand on the outskirts of St. James’s Park, filled with vertiginous crops. A sky-scraping ‘energy tower’ nearby would have plants growing on every floor, and a smart grid would be installed for efficient energy use. London Lives makes available, in a fully digitised and searchable form, a wide range of primary sources about 18th-century London, with a particular focus on plebeian Londoners. It includes over 240,000 manuscript and printed pages from eight London archives and is supplemented by 15 datasets created by other projects. It provides access to historical records containing over 3.5 million name instances. Facilities are provided to allow users to link together records relating to the same individual, and to compile biographies of the best documented individuals. While the bulk of the sources included concern criminal justice and poor relief, there are also records of a guild (the Carpenter’s Company) and a hospital (St Thomas’s), as well as databases of tax and voting records, wills, fire insurance registers and urban directories.